Racism is alive and kicking. We see it in the news; we see it in our lives. And yet our modern concept (and practice) that involves notions of “race”—on which racism rests—is a recent invention. While people and their societies have long distinguished among themselves—Romans distinguished between “citizens” and “barbarians,” and the Zuni spoke of “winter” and “summer” people—the concept of innate superiority or inferiority among people, as opposed to environmentally or culturally-acquired characteristics, is only a few centuries old. Neither genetically-based nor a biological category but a function of power (those in power disproportionately determine standards of beauty, morality, comportment, and intellect), race, like all other identities, has been a constructed and shifting term in world history. Ancient and other pre-modern societies took difference in tribal affiliation, place of origin, language, class, religion, and foods eaten, as distinguishing factors among people: Egyptians during the New Kingdom depict four “races” in the Book of Gates, but presented these as geographic in origin, with each figure holding similar status; in China, distinctions were made between “raw” and “cooked” peoples; meanwhile, Aristotle in Politics argues that colder climates produced socially and politically inferior kinds of people in comparison to those who lived in temperate climates, such as his own Aegean. Centuries later, Muslims divided people into “believers” (People of the Book) and “nonbelievers” (kaffir), the latter implicitly viewed as morally inferior (now used as a racial slur in southeastern Africa); and in the Deccan, paintings from the early modern era depict dark-skinned Abyssinian elites in India being attended to by lighter-skinned pages, with class being the overriding distinction in that case. 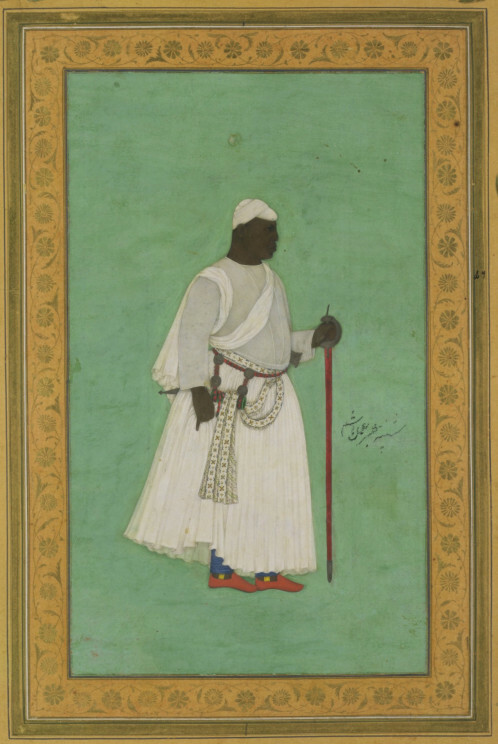 The early modern figure Malik Ambar, an Abyssinian who was enslaved and rose to become de facto king of the Sultanate of Ahmednagar in western India, provides a vivid example of the differences in notions of race among people of African descent in the Indian Ocean world versus the Atlantic world. “Malik Ambar” by Hashim. Public Domain via Wikimedia Commons. Born into an Oromo (Ethiopian) family in 1548, he was enslaved and then taken to Baghdad, where he was educated, later being taken to India as part of the military slave system across this part of the world. In India, he rose to power in the last decade of the sixteenth century and became Regent Minister of Ahmednagar. He ruled the sultanate for the first quarter of the seventeenth century, demonstrating that his black/African ‘race’ in this part of the world, at this particular time, did not over-determine his upward mobility. Indeed throughout the sixteenth and seventeenth centuries in western India there were dozens of Africans who were regarded as nobles—black nobles in South Asia, sometimes depicted in art as superior to non-black people, who served them. Race, being a social and political construct, and therefore unstable and inconsistent across time and location, has changed repeatedly. In the United States alone racial groupings as they appear in the US Census have changed over one dozen times since 1790. Moreover, what constituted “black” in one state changed when entering another state. Along these lines, someone considered “black” in the United States might be considered “white” in Brazil. Such racial distinctions—whether in North America, South America, Africa, Western Europe, South Asia, or East Asia—have had a profound, and often limiting, if not destructive impact on people’s lives. Among the consequences of what may be called scientific racism (including theories of monogenesis and polygenesis) has been the justification of violence against certain identifiable groups of people for economic exploitation—most notably, sub-Saharan Africans and their descendants in the Americas—centered on notions of “natural” inferiority. The “science” was expressed in medical terminology: during the nineteenth century enslaved African Americans were diagnosed, for instance, with “drapetomania,” a term coined by Virginian physician Samuel Cartwright (the “disease” of black slaves wanting to run away from captivity, with the prescription being whipping). Race made scientific has ravaged other groups of people. On the other side of the Atlantic, and a few generations later, the racial policy in Nazi Germany of handling lebensunwertes leben (“life unworthy of life”) led to the murder of millions of Jews during the twentieth century. Related kinds of scientific racism also justified the seizure of land and the restriction of migrants into the United States. During the early twentieth century “mixed-blood” versus “full-blood” tests involved “drawing with some force the nail of the forefinger over the chest,” and seeing the mark left, to justify taking land away from Native Americans; likewise, Congressional legislation restricted immigration from Southern and Eastern Europe based on “intelligence” tests, replacing cranial measurements as proof of racialized intellectual capacities. Therefore, despite the defeat of twentieth-century European and Japanese fascism and the dismantling of Jim Crow in the American South, despite the end of Apartheid in South Africa and the discrediting of scientific racism with the mapping of our genes, and despite multiple declarations by the international community in favor of human rights based on a widespread understanding of our single human species, purported racial differences and institutional forms of racism persist. But if world history teaches us anything, our modern conceptions of race will themselves change as power—specifically, those who have it and how they choose to exercise it, shaping notions of difference—undoubtedly change over time. Image Credit: “Sign for the “colored” waiting room at a bus station in Durham, North Carolina, 1940″ by Jack Delano. Public Domain via Wikimedia Commons. Omar H. Ali is a historian at The University of North Carolina at Greensboro and was named North Carolina Professor of the Year by the Carnegie Foundation. 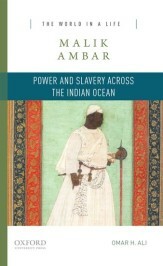 He is the author of Malik Ambar: Power and Slavery Across the Indian Ocean (OUP, 2016). The war on science continues.